The Graduate (1967) is one of the key, ground-breaking films of the late 1960s, and helped to set in motion a new era of film-making. The influential film is a biting satire/comedy about a recent nebbish, East Coast college graduate who finds himself alienated and adrift in the shifting, social and sexual mores of the 1960s, and questioning the values of society (with its keyword "plastics"). The themes of the film also mirrored the changes occurring in Hollywood, as a new vanguard of younger directors were coming to the forefront. Avant-garde director Mike Nichols, following his debut success of Who's Afraid of Virginia Woolf? (1966) with this second film, instantly became a major new talent in American film after winning an Academy Award for his directorship. The two different generations are also reflected in other dualities: the two rival women (young innocent doe-eyed daughter Elaine and the older seductress Mrs. Robinson), the two California settings (Los Angeles and Berkeley) and S. and N. California cultures (materialistic vs. intellectual), and the division in Benjamin's character (morally drifting and indecisive vs. committed). There was already a growing dissatisfaction with the status quo and middle-class values, and the breakthrough film mirrored that anarchic mood perfectly for America's youth of the 60s during the escalation of the Vietnam War. However, in the final analysis, director Nichols actually subversively portrayed how aimless and unalive the disaffected young generation was (in the character of Benjamin) - and would become as they approached middle-age and worked in sterile corporate settings. [In the same year, it joined Bonnie and Clyde (1967) as one of the most popular films for the college-aged generation.] It was complemented by the music of the popular singing duo Simon and Garfunkel from their Grammy-winning The Sounds of Silence album (with songs composed earlier and previously-released except for "Mrs. Robinson"), with meaningful, haunting lyrics amidst koo-koo-kachoo sounds to enhance the film's moods and themes. The film was adapted first for the stage (at London's Gielgud Theatre), and then premiered on Broadway in early April of 2002, with Kathleen Turner reprising her role as Mrs. Robinson, along with Jason Biggs and Alicia Silverstone in the other major roles. Many viewers of this mid-60's film were unaware that Harold Lloyd's race to the rescue to prevent the wedding of a girl he loves earlier appeared in the silent-era film comedian's influential film Girl Shy (1924). The film was nominated for a total of seven Academy Award nominations, including Best Picture, Best Actor (Dustin Hoffman), Best Actress (Anne Bancroft), Best Supporting Actress (Katharine Ross), Best Adapted Screenplay, and Best Cinematography. The film won only one award - Best Director. The Oscar-nominated screen adaptation by Calder Willingham and Buck Henry (who appears as the hotel's desk clerk) was based on the novel of the same name by Charles Webb (a recent graduate of the East Coast's Williams College when he wrote his first novel). Warren Beatty, Charles Grodin, Robert Redford, and Burt Ward (the 'Robin' character of the TV series Batman) were all considered for the role of Benjamin, and Patricia Neal and Doris Day were considered for the part of Mrs. Robinson. Short-statured (5'6") Jewish actor Dustin Hoffman had already been cast as Nazi playwright Franz Liebkind in The Producers (1968) when he bowed out and took the role of bumbling graduate Benjamin Braddock. His defection forced Mel Brooks to quickly recast the trademark role with Kenneth Mars. ...And in the naked light I saw, ten thousand people, maybe more. Ben: I guess about my future. Mr. Braddock: ...to be what? Ben is confused and frustrated, trying to make sense of adult life and game-playing, and attempting to find his own standards. He is struggling to search out an honest and sincere way to live his own life, without following his parents' California lifestyle. Hey, there's the award-winning scholar. We're all very proud of you, Ben. Guests: We're all so proud of you, proud, proud, proud, proud, proud, proud, proud. What are you going to do now? Ben: I was going to go upstairs for a minute. Guests: I meant with your future, your life. Ben: Well, that's a little hard to say. [In fact, history would prove Mr. McGuire's advice to be prescient and wise!] Sweating and unable to take any more badgering and unwanted advice, feeling generally repugnant of the upper middle-class values that surround him, Ben realizes that he is totally estranged from the financial measures of value that are being thrust upon him for his future. He retires to his bedroom to lie down while everyone listens to his accomplishments from his college yearbook: "Captain of the Crosscountry Team, Head of the Debating Club, Associate Editor of the college newspaper in his Junior year, Managing Editor in his Senior (He slams his bedroom door shut.)..." Ben's alienation is symbolized by shots through glass - he looks out on the backyard swimming pool through the upstairs window. His face is viewed through his fish tank's glass as he stares into it and studies it - possibly envying the peaceful position of the plastic deep sea diver. When a black-clad Mrs. Robinson (36 year old Anne Bancroft, only 6 years older than Hoffman), the wife of his father's business partner, opens his bedroom door in the frame, they both appear behind the pane of glass. She has followed him there (first viewed in the living room eyeing him from the sofa in the background), explaining that she is looking for the bathroom, but her interest in him belies her excuse. Looking upset, Ben admits he is "disturbed about things" in general and would rather be alone. She insists that he drive her home because her husband has already left with their car. When he offers his own car keys ("Do you know how to work a foreign shift") and she claims that she can't drive a stick shift, she throws the keys into the aquarium - right onto the top of the miniature scuba diver figure. He reluctantly agrees ("Let's go") after fishing out his keys. Mrs. Robinson: Would you mind walking ahead of me to the sun porch. I feel funny about coming into a dark house. Ben: But it's light in there. Mrs. Robinson: What do you drink? Bourbon? Ben: Look, uh, Mrs. Robinson, I drove you home. I was glad to do it. But I have some things on my mind. Can you understand that? Mrs. Robinson: (She prepares drinks for both of them.) What do you drink? Benjamin. I'm sorry to be this way, but I don't want to be left alone in this house. Mrs. Robinson: Please wait till my husband gets home. Ben: When is he coming back? Mrs. Robinson: I don't know. Drink? Ben: No. (She hands him one anyway.) Are you always this much afraid of being alone? Ben: Well, why can't you just lock the doors and go to bed? Mrs. Robinson: I'm very neurotic. (She turns on some music.) May I ask you a question? What do you think of me? Mrs. Robinson: You've known me nearly all your life. You must have formed some opinion of me. Ben: Well, I always thought that you were a very...nice...person. Mrs. Robinson: Did you know I was an alcoholic? Mrs. Robinson: Did you know that? Ben: Look, I think I should be going. Mrs. Robinson: Sit down, Benjamin. Mrs. Robinson: My husband will be back quite late. He should be gone for several hours. 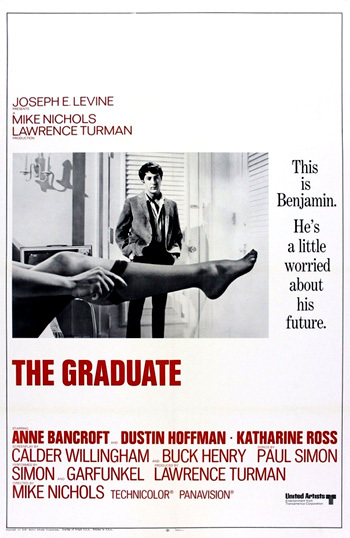 Ben: Oh no, Mrs. Robinson, oh no. Ben: I mean, you didn't really think that I would do something like that. Ben: For God's sake, Mrs. Robinson, here we are, you've got me into your house. You give me a drink. You put on music, now you start opening up your personal life to me and tell me your husband won't be home for hours. Ben (naively): (The camera shoots under her upraised leg, framing Ben underneath) Mrs. Robinson - you are trying to seduce me .... Aren't you? Mrs. Robinson: Well, no. I hadn't thought of it. I feel very flattered. Ben: Mrs. Robinson. Will you forgive me for what I just said? Mrs. Robinson: Will you unzip my dress? I think I'll go to bed. Mrs. Robinson: Won't you unzip my dress? Ben: I'd rather not, Mrs. Robinson. Mrs. Robinson (imperiously): If you still think I'm trying to seduce you...? Ben: No, I don't, but I just feel a little funny. Mrs. Robinson: Benjamin. You've known me all your life. Mrs. Robinson: Come on. It's hard for me to reach. (He complies and pulls the zipper down.) Thank you. Mrs. Robinson: What are you so scared of? Ben: I'm not scared, Mrs. Robinson. Mrs. Robinson: Then why do you keep running away? Ben: Because you're going to bed. I don't think I should be up here. Mrs. Robinson: Haven't you ever seen anybody in a slip before? Ben: Yes, I have, but I just...Look, what if Mr. Robinson walked in right now? Mrs. Robinson: What if he did? Ben: Well, it would look pretty funny, wouldn't it? Mrs. Robinson: Don't you think he trusts us together? Ben: Of course he does, but he might get the wrong idea. Anyone might. Ben: But they would! Don't you see? Mrs. Robinson: Benjamin. I am not trying to seduce you! Ben: I know that, but please, Mrs. Robinson. This is difficult..
Ben: (A long pause.) I'm going home now. I apologize for what I said. I hope you can forget it. But I'm going home right now. For God's sake, Benjamin, will you stop acting this way and bring me the purse!